America’s doctors and hospitals moved one step closer toward collecting a part of the $27.3 billion government incentive program encouraging them to invest in document scanning and scan their paper charts into Electronic Health Records (EHRs). The program is part of the 2009 Economic Stimulus Act which supports electronic document management. 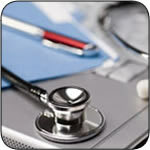 According to the American Medical Association, there were more than 800,000 physicians in the U.S. in 2009. Of these, only 6.3% of physicians reported having a fully functional EHR system in place, according to the Center for Disease Control. This leaves a lot of room for improvement in the area of electronic document management. “The widespread use of electronic health records EHRs in the United States is inevitable,” David Blumenthal, National Coordinator for Health Information Technology, said in a statement. Bluementhal’s office, which is part of the Department of Health and Human Services, announced new “meaningful use” rules that support and expand the use of electronic health records, making universal record scanning a potential reality . Blumenthal believes the changes allow health care professionals to finally make the technology advancements that other sectors of our economy began to undertake years ago with records management. “EHRs will improve caregivers’ decisions and patients’ outcomes. Once patients experience the benefits of this technology, they will demand nothing less from their providers. Hundreds of thousands of physicians have already seen these benefits in their clinical practice,” he said. The EHR grants were included as part of the 2009 Economic Stimulus Act. They were designed to accelerate the transition from paper documents to EHRs for medical practices in five years, making document scanning a lucrative investment. It provides $44,000 to $63,750 to eligible health professionals from Medicare and Medicaid, respectively. In order to qualify for $44,000 or more in stimulus plan incentives, physicians must meet the “Meaningful Use” criteria using an HHS-certified EHR system. When the EHR grants were initially proposed, the criteria to qualify for government funds was rigid, and included an “all or nothing” approach. But now, hospitals and professionals have to meet a core set of 14 or 15 objectives, respectively, and may choose five of the remaining 10 objectives in an Ã la carte menu. The money will be distributed in bonus Medicare payments for adoption of electronic health records over the next 10 years. The new rules also define the standards that must be met by EHR technology so medical providers have confidence that the EHR system that they select will perform all the required functions. Get Free, No-Hassle Quotes on Medical Record Scanning Today! Record Nations can ensure that you are hiring a medical records imaging provider who will handle your project in a secure manner. We are the experts in medical records scanning services, and have created a network of professional medical records scanning providers who are ready and capable of handling your sensitive records.